Pretty much everyone has daydreamed about being hit on by their favorite celebrity – or hooking up with them. Maybe you've even imagined what it would be like to be a fan married to a famous person. Thanks to the advent of social media and the direct messaging function that has become oh so popular on Twitter and Instagram, those daydreams could become slightly sleazier realities. There are plenty of stories about celebrities hitting on fans in direct messages. Famous people using DMs to hit on normal people is a shockingly common occurrence. Or, at least, the number of civilians exposing celebs on social media has increased. Celebrities who hit on fans via direct messaging run the risk of making headlines with their horniness if the intended hookup takes a savvy screenshot. Maybe you heard about the James Franco DM scandal, but that's just the tip of the iceberg. In April 2014, Renaissance man James Franco got his creep on and slid into a 17-year-old girl's DMs via Instagram. The Scottish girl, Lucy, met Franco outside the stage doors for Of Mice and Men on Broadway, which he was starring in at the time. He took an Instagram video with her, telling her "you got to tag me." Lucy did, and Franco began messaging her – and didn't back off when he found out she was underage. Lucy took screenshots of the conversation, and Franco promptly landed in hot water. Later, he admitted to demonstrating poor judgment on Live with Kelly and Michael. Basketball star Lebron James popped up in the DMs of 18-year-old Instagram model Rachel Bush. The much older(and much more married) NBA player messaged her, "Hey what's up!" Bush posted screenshots of her interaction with James on Twitter, but has since deleted them. Justin Bieber attempted to track down a girl who caught his eye via social media, but he went about it in a very peculiar and roundabout way. In August 2017, Bieber must have been lurking on a gym's Instagram when he noticed a female employee. 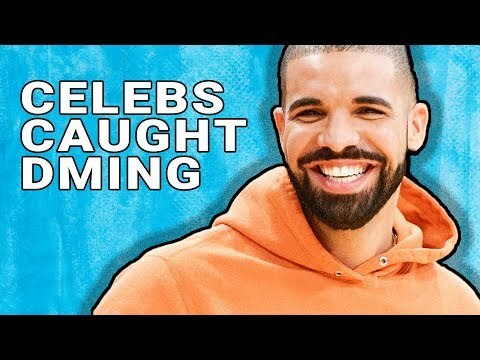 Adult film star Mia Khalifa isn't exactly a random civilian, but she doesn't have the name recognition of a superstar musician like, say, Drake. But it seems that the musician is a fan. In January 2015, Khalfia hinted to a radio show that he slid into her DMs to hit on her. According to Khalifa, Drake sent her half-naked pics of himself via Instagram – pictures she described as "cringeworthy."